Major Knapp led the formation on the first mission this Group ever flew to Ploesti. About 30 enemy planes were seen, and a few were encountered. There were no claims. Flak at the target was intense, accurate and heavy. Crewmembers were surprised at the amount of flak coming from guns placed in open fields outside the city limits. Seeing that his target had been hard hit and was completely obscured by smoke, the lead bombardier, Lt. King, swung from his briefed target to the large South Marshalling Yard, which was hit with fair results. The decision by Lt. King brought repercussions from the Group Commander, the 49th Wing, and the Air Force. On the return route, the formation passed over the defended Bor Mines area and was shot up badly by flak. As a result of this flak, the Group brought back with its first man killed in action, 2nd Lt. Joseph F. Meyers, a bombardier. Two other men were wounded and every airplane in the formation was hit. On the last day of the month the Group made its second trip of the month to Ploesti. In defense of the target, the enemy added smoke screens to his aggressive fighter resistance and flak concentration. Despite this resistance Captain Leffler got a score of 27 percent for the mission. On this day, while our ground forces were invading the coast of France from England, the bombers of the Fifteenth Air Force struck again at the Germans’ source of oil at Ploesti. Captain Goree led this mission, the only one flown to that target area during the month of June. He was especially successful in keeping the Group out of much of the flak. All the targets in the Ploesti area were completely covered by most effective smoke screens. The city, which was the first alternate target, was bombed on ETA with unobserved results. Several enemy aircraft were seen and one was destroyed. All of our planes returned to base, nineteen of them with flak holes. The all-out mission of the Fifteenth Air Force against the Ploesti Oil Refineries on the 15th of July had been designed as the final knock-out blow. On the 26th of June, the Air Force had conducted a meeting with representatives of all the Groups to discuss this mission and to clarify pathfinder bombing. The day following this conference Captain Leffler began both a bomb trainer program and an air training program to continue pathfinder methods which were already well developed in this Group. Carefully selected flight leader crews were withheld from combat missions during this intensified training program. For days they flew practice missions against Pianossa Island. Fully two weeks before the mission was flown, the 461st Group had been designated as the Group to lead the Wing. This put Colonel Glantzberg in the lead plane. With him were the old reliable team of Captain Strong, Captain Leffler, Captain Pruitt, Lt. Sullivan, and Lt. Gizelba. Colonel Lee flew as Wing Commander with Captain Waiters. The Creditul Minier Oil Refinery, three miles south of the city limits of Ploesti, was the Wing target. Using pathfinder methods, Lt. Gizelba completely saturated the vital installations of the refinery with bombs. The success of the mission earned for Colonel Lee and Lt. Gizelba the Distinguished Flying Cross. The target was partially obscured by six-tenths cloud coverage. Intense, accurate and heavy flak damaged fourteen of our planes and knocked down the one piloted by 1st Lt. William L. Weems. Still rough. Despite the efforts of the Air Force on the 15th day of July to finish off Ploesti, the Romana Americana Oil Refinery was assigned to the Group as its target for 22 July. All the planes dropped their bombs as briefed on the Group leader. All of them fell short of the target. Of the twenty-two planes on the bomb run seventeen were hard hit by flak and four others were lost. Two planes, one piloted by 2nd Lt. Clarence W. Bloxom and the other one by 2nd Lt. Elias R. Moses, both of whom were flying their second combat mission, left the formation after the target and disappeared. 1st Lt. Taylor bailed his crew out near the base when he had but one engine left. 1st Lt. Holmes also bailed his crew out near the base when leaks in his gas line caused him to run out of fuel. One man on Lt. Taylor’s crew, F/O Irving Smithkin, was fatally injured in parachuting to earth. The 280 heavy anti-aircraft guns at Ploesti had turned the trick for the first time of keeping the 461st from reaching its target. Back again to the guns out in the fields at the old familiar target, the Xenia Oil Refinery, Ploesti. Back again to the smoke screens, high towering black clouds from the burning oil, and to pathfinder bombing. The results: no score: photographs which show nothing but smoke; thirteen planes with holes in them. Crewmembers who had become accustomed to results like those at Blechhammer and at Ploesti frequently wondered how much or how little damage they were really inflicting on these targets. With the invasion of southern France from the Mediterranean now successfully under way, the Fifteenth Air Force swung back for targets to sources of German oil. The target assigned to the 461st Group was the Romana Americana Oil Refinery at Ploesti, Roumania. This target was the largest and most important of all the vital oil installations at Ploesti. This was the target that the Group had failed to reach on 22 July when the formation was stopped short of its objective by flak. This mission was the seventh to be flown by this Group to Ploesti. Although no one knew it at the time, this was destined to be the last mission to be flown by this Group against this first priority target which had long since been recognized by all United Nations as one of the most important and well defended target areas possessed by the enemy. On 30 August 1944 what was left of the Ploesti oil supply and industry was captured by the Russian Army. Despite the fact that it took a lot of explaining on the part of some of the twelve crews who were early returns from this mission, in many ways the mission was the most successful ever flown by this Group against a Ploesti target. 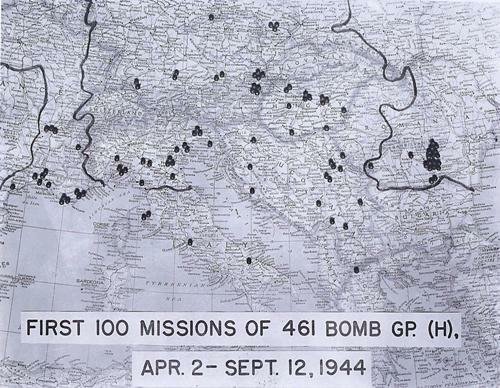 The 19 Planes that made it over the target dropped 45.6 percent of their 146 five hundred pound RDX bombs within 100 feet of the briefed aiming point. Numerous hits were scored in the tank farm at the northwest corner of the refinery; one string of bombs fell across the center of the refinery with four direct hits on the storage tanks in that area which resulted in large fires; and the distillation units, the boiler house, and some of the administration buildings were also hit. No fighters were encountered. With CAVU weather at the target, the master anti-aircraft gunners, who had been getting plenty of practice all summer, were up to par with their effort. As a result, fourteen of the nineteen planes over the target were hit and the one flown by 2nd Lt. Thomas C. Moore failed to return from this mission. Most of the twelve planes which returned early from the mission were those which had been flying in the rear positions of the various flights. When Lt. Colonel Hawes was compelled by mechanical failure to abandon the Lead position in the formation, the lead was taken over by the Deputy Leader, Captain Ryder. This was the first mission that Captain Ryder had led. Due to his inexperience plus the fact that his plane was not accurately calibrated, he maintained too high an air speed en route to the target. As a result, the “tail end Charlie” planes were unable to climb and maintain position in the formation.